In November, 2011 I was interviewed by CBC and hoped that my “Save-at-Home-Mom” story would inspire and encourage other families who wanted to keep one parent at home but weren’t sure if they could swing it financially. I had a lot of fun walking through the grocery store aisles with a reporter and camera crew and couldn’t wait for the story to air. The piece was edited significantly and in the end, highlighted only the couponing and discount shopping component of our savings strategy. And then the trolls came out. People took the time to type lengthy comments on the CBC website, and later on Yahoo, Canoe, and several other news sites that carried the story. Imagine. I actually found myself on the phone with my mother defending myself. “No Mom, I didn’t buy a SUV.” In fact, we were driving a Pontiac Vibe at the time, which had an odometer stuck at 299,999 which we finally sold after it hit (what we think was) 306,000 km. A far cry from a $40K SUV! “No Mom, I didn’t buy an iphone.” Until recently, I used an old flip phone complete with a stainless steel frontplate being held on with scotch tape. It had no internet, no camera, and the antennae had long since fallen off. It worked just fine as a phone until I was eligible for a free smartphone with the renewal of my 3 year contract. I still pay just $15 a month for emergency phone service and rely on open wireless connections if trying to do anything “smart”. Other than the odd photo of skating or hockey medals in The Wingham Advanced Times, this was my parents’ first experience in dealing with media, and certainly our family’s first brush with the new interactive media (I hesitate to say “social” because some of the interaction was quite anti-social, in my opinion!). It took some convincing, and a reminder that I don’t have a “Fat Kid named Billy” to assure my parents that just because something is posted on the internet, doesn’t mean it’s true, nor does it reflect everyone’s opinion or reflect poorly on our family. I’m not sure I convinced them, and at times I didn’t even convince myself. I retreated into my “coupon closet” and continued to save in silence. In the months to follow, I paid even closer attention to what I was saving on, was more diligent than ever about not holding up fellow customers in line when I was redeeming coupons, and spent some significant time crunching our numbers to prove to myself that I really was saving by being at home. I was. I am. My conviction to share my story in my own words continued to grow and I began looking for an outlet. I began writing for CanadianCoupons.net in February, 2012 and became a page administrator for their Facebook community when it was 4,000 strong. It was so refreshing to be a part of a like-minded community of savvy shoppers, clever couponers, and frugal folks who shared tips and ideas so openly with each other. And as the community grew and I found my social media voice, I took my first step out of my coupon closet. I started writing under my new pen-name, Christa Clips and began sharing more details about our family, savings strategy, personal purchases, etc. We’ve reached 23,000 community members and are still growing. Check us out! Even though I write about our family’s savings strategy, I have never disclosed our household income. My husband works full time, I care for children before & after school, and I am paid for some of the writing I do on various websites and blogs. Our income and our family budget are actually irrelevant to my story: the important numbers that I hope to share, and that others can apply to their own family budget, are how much I’m saving by being at home. That is, what I’m not spending on major working-family expenses like daycare, commuting, wardrobe, etc. right down to minor expenses that I’ve been able to cut like coffee breaks, changing how our lunchboxes are prepared, and having the time to throw children’s birthday parties at home, on a budget. So where does the Clip part come in? I do clip coupons and am consistently able to cut our grocery bill by 50% while actually improving the quality of food and amount of home cooking (notice I didn’t say quality of the home cooking! I’m such a “non-foodie” … it’s laughable!) These coupon savings are one small piece of the equation but they do push our budget into the green: it would cost us more money if I were to go back to work outside the home and no longer have the time to collect, organize and redeem coupons to save on our weekly household expenses. 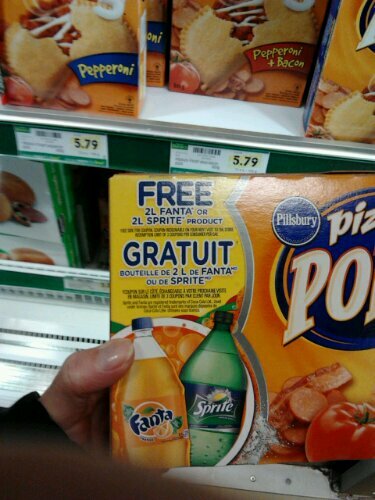 Today while shopping at Food Basics I passed the dreaded Pizza Pop aisle which always reminds me of those nasty trolls and how ashamed I felt to be a couponer just a little over a year ago. I’m still guarded about when and to whom I share that I’m a tad coo-coo for coupons, but am infinitely proud of how much I’m able to stretch our household income and be able to stay home with our children. I’ll be sharing my tips and triumphs, finds & flops here in my Christa Clips: Save-At-Home-Mom blog, and you can read more ramblings daily over on CanadianCoupon.net in the article section. Evidently, I won’t be adding this Pizza Pop coupon to my collection: the tear pad was empty but there was a coupon right on the box. For FREE pop. Billy would have loved it!